Ultrasonic Rat Repellent Devices - Do They Work? Observing a rat, whether indoors or out can have you reaching for what’s marketed as the quickest form of control, an ultrasonic rat repellent. The scientific name itself sounds appealing and high tech right? However, before you start spending money on products promoting their superior qualities at controlling rats, it's best to do a little research and use something that's going to work. Nobody wants rats invading their space, especially because they can cause fire hazards due to chewing electrical wiring and worst of all, they carry all sorts of diseases. So, when you purchase a product, make sure it is going to do the job. Otherwise, your one or two rat visitors will soon develop into a full-fledged rat infested nightmare. Rats are prolific breeders so it won't take long for a couple of rats to turn into a real problem, especially since your home supplies all the food and shelter they need to thrive. The best way to solve a rat problem is to address it quickly and properly before it becomes out of control. The first step in getting a hand on a rat problem is to identify which rat has packed up its belongings and moved into your home. Remember, rats have been living with humans forever, so they have no problem cohabitating with us. The two most common rats that are happy sharing space with humans are the Norway rat and the roof rat. Though to most people a rat is a rat, however, each of these rodents has distinctly different looks and areas of your home they prefer to live. By figuring out which rat has invaded your space, you’ll be better equipped at successfully getting rid of them before their population explodes out of control. 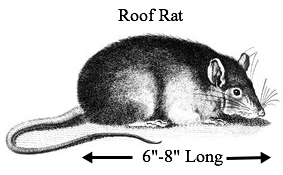 Larger than roof rats with a blunt muzzle and usually brownish-red with a belly that is gray. Short, scaly tail, with smallish ears that if folded, won’t cover the eyes. 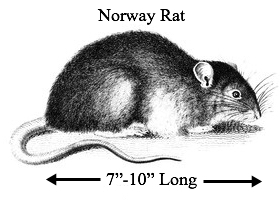 Smaller than the Norway rat, with a pointy muzzle and body colorations of blackish, gray or tan. Long tail that is generally longer than the entire length of the body. Big ears that when folded, cover the eyes. Nimble climbers and jumpers that prefer to live in higher elevated locations such as inside attics. Ultrasonic Rat Repellents - What Are They? Just reading the names of some ultrasonic rat repellent devices gives you the impression they have to work because their names sound so scientific. Marketed as everything from sonic/ultrasonic rat repellent, electromagnetic repelling device, mechanical/vibrational rat repellent and electronic rat barrier devices, they sound more suitable for a Frankenstein movie than for rat control. You have to give the manufacturer’s credit for coming up with some great sounding technical names. Just to hear the names makes you think, “They have to work because their name sounds so high-tech.” However, don't be lured into fancy marketing techniques because you'll be purchasing a name and not a useful product. Standard ultrasonic rat repellent devices are simple boxes with an LED light that turns on when the unit is plugged in (some operate off batteries). Ultrasonic systems are supposed to work by emitting a high-frequency sound that drives the rat insane and has it packing up and leaving your residence for a quieter location. However, most animals hear the same sound frequency range as us, so if the device isn’t driving you from the home, it’s very doubtful it will work on the rat. When browsing for ultrasonic rat repellents, it’s very doubtful the package will reference government and true scientific studies on the devices. After all, the company is trying to make a buck off the purchaser’s aversion to having rats in their home and their attempt to get rid of the problem quickly. Multiple universities have done studies on the benefits of using these devices and all have come to the same conclusion – they don’t work. In fact, in the 1980s the Federal Trade Commission charged several companies selling ultrasonic rat devices with false advertising and making unsubstantiated claims about how well they worked. The companies had to reimburse customers who purchased the faulty merchandise. Scientific tests conducted using ultrasonic rat repellent devices showed caged rats set next to the box continued to carry out their lives unaffected by the sound. The rats even continued to reproduce. The advertised frequency of ultrasonic sound only outputs the maximum frequency in a range of 12-inches around the device. Farther from the source, the ultrasonic sound quickly diminishes, so unless the rat continues to stand next to the device, the sound won’t affect it. Soft-textured materials such as insulation or cloth quickly absorb ultrasonic energy, as do any angles or corners in the area, reducing frequency too. Therefore, unless the room containing the ultrasonic rat repellent is only a square shell containing nothing but the device, the area itself will reduce its ability to work. After reading all of this you may ask, “What’s a person to do when it comes to getting rid of and repelling rats?” Proven control options are quite basic and won’t bust your pocket book, though they do take a bit of physical work and diligence on your part. Physically check around the outside of your house for any openings, large or dime-sized, where the rat can get inside. Potential entranceways can be openings around plumbing pipes, missing soffits, openings for roof vents or fans, doors or windows not properly sealed, etc. Seal any potential entranceways with products like 1/4-inch hardware cloth or cement, which makes it impossible for the rat to gain entry. 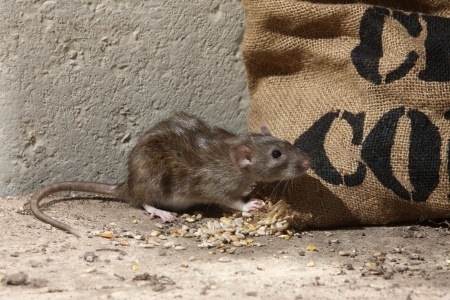 Rats love clutter and garbage, so clean the area outside the house and indoors, making it inhospitable to the rodents. Seal garbage cans, discard trash, keep foliage trimmed from the house, seal foodstuffs in rodent-proof containers and keep stored items off the floor. Use snap-traps baited with something like peanut butter and placed 10 feet apart, if you notice a rat indoors. They are inexpensive, can be used multiple times and best of all, they work.